This Blueberry BBQ Sauce Recipe was originally featured in my Dr. Pepper Chicken Wing Recipe. This blueberry sauce was incredible on chicken wings, but since I first made it, I’ve tried it on pulled pork and burgers, and it’s been delicious on those too! 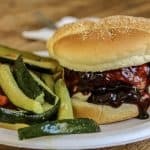 This homemade barbecue sauce is really easy to make. In total, it should only take about twenty minutes to make. You’ll want to let it chill before you use it. I was shocked by how well the flavors melded together when I first tried it! Stir all of the ingredients together over high heat. Once the sauce has started to boil reduce the heat and simmer for about ten minutes, occasionally stirring to prevent burning. When you first start stirring the blueberries will hold their shape, but once they warm up they will mush down, and all that will remain is some of the skin. I was worried about all the pulp when I started, but you don’t even notice it when you’re done. After a few minutes of simmering the sauce will thicken up considerably. Pour the sauce into a mason jar and set aside. I let the sauce cool for about 15 minutes before I put the lid on the jar refrigerated it. I was pleasantly surprised by how delicious this sauce turned out. It is definitely a little sweeter than traditional barbecue sauces I’ve tried or made, but it’s not too sweet. This blueberry bbq sauce goes well on beef, pork, and chicken. I encourage you to give it a try the next time you have fresh blueberries, or you are looking for a unique sauce to add to your barbecue! This Blueberry BBQ Sauce Recipe was originally featured in my Dr. Pepper Chicken Wing Recipe. 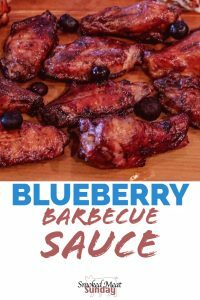 This blueberry sauce was incredible on chicken wings, but since I first made it, I've tried it on pulled pork and burgers, and it's been delicious on those too! This homemade barbecue sauce is really easy to make. In total, it should only take about twenty minutes to make. You'll want to let it chill before you use it. I was shocked by how well the flavors melded together when I first tried it! In a medium saucepan combine all of the ingredients, adding the water last. Stir all of the ingredients together over high heat. Once the sauce has started to boil reduce the heat and simmer for about ten minutes, occasionally stirring to prevent burning. After a few minutes of simmering the sauce will thicken up considerably. Pour the sauce into a mason jar and set aside. I let the sauce cool for about 15 minutes before I put the lid on the jar and refrigerated it. I was pleasantly surprised by how delicious this sauce turned out. It is definitely a little sweeter than traditional barbecue sauces I've tried or made, but it's not too sweet. This blueberry bbq sauce goes well on beef, pork, and chicken. I encourage you to give it a try the next time you have fresh blueberries, or you are looking for a unique sauce to add to your barbecue! I was looking for a BBQ sauce I could make (other than mustard style) that didn’t rely so heavily on a tomota base because as it turned out I had no tomato sauce and almostly exactly 3/8 cup of ketchup left. This was really good. Fit the bill perfectly and the baby backs were great with it. Nice work!